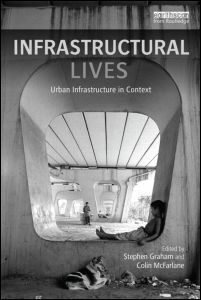 I’m delighted that a new book that Steve Graham and I have edited has just come out, Infrastructural Lives (http://www.routledge.com/books/details/9780415748537/). Steve and I wanted to produce a book that examined the everyday experience of urban infrastructure – its politics, cultures, economies and ecologies – and to show how this experience varied within and across urban contexts. We’re very pleased with the result, in which a great group of contributors examine how infrastructure is made and unmade, politicised and lived, stabilised and rendered fragile, in Rio, Kampala, Ramallah, Jakarta, Bangalore, Mumbai, and various urban contexts in the UK. The book revolves around four key questions. First, how does a focus on the everyday help us to understand how urbanites know and use infrastructure? Second, how do processes of urban violence, pacification and dispossession through infrastructure impact everyday urban lives? Third, what everyday practices and discourses allow for the production and management of urban waste infrastructure? And finally, how do forms of everyday infrastructure adjustment and experimentation emerge from and reshape everyday urban life? Contributors include AbdouMaliq Simone, Maria Kaika, Vyjayanthi Rao, Mariana Cavalcanti, Stephanie Terrani-Brown, Omar Jabary Salamanca, Rob Shaw, Harriet Bulkeley, Vanesa Caston-Broto, Simon Marvin, Mike Hodson, Renu Desai, Steve Graham, and myself. Arjun Appaduria kindly provided a thoughtful foreword for the book. This entry was posted in Infrastructure, Publications on November 5, 2014 by colinmcfarlane.